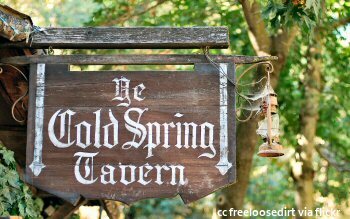 The Cold Spring Tavern is easy to miss, but certainly not easy to forget once you've been there. An historic stage stop on the route from the coast to the Santa Ynez Valley, the hospitality of previous centuries still lives here, along with great food and beautiful surroundings. A previous Photo of the Week selection. Highway 154 and the San Marcos Pass is the main alternate route to Highway 101 into and out of Central California. It is not a divided road, but is well-maintained and has numerous passing lanes so it isn't a bad drive. 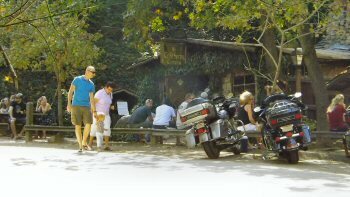 However, if you are taking the "Chumash Highway" as a slower-paced drive, you would do well to take a little side trip off the main road and back into the past to the Cold Spring Tavern on Stagecoach Road. The Cold Spring area has been bypassed since the construction of the Cold Spring Arch Bridge in the 1960's. It was right on the main route, though back in the days. "Stage" coaches were so named because the route was divided up into segments or stages with stops for the passengers comfort and feeding or changing out the horses. Not unlike travel today in most ways. The main difference is that the "stages" then were much shorter distances than those we expect today. The turnoff for Stagecoach Road is found at the southern end of the Cold Spring Bridge and the Tavern is only 1.5 miles past the turnoff. Hours: Weekdays - Lunch 11am - 3pm; Dinner starts at 5pm. Weekends - Breakfast 8am - 11am; Lunch 11am - 3pm; Dinner starts at 5pm. Dinner reservations are recommended. Musical entertainment on the weekends. 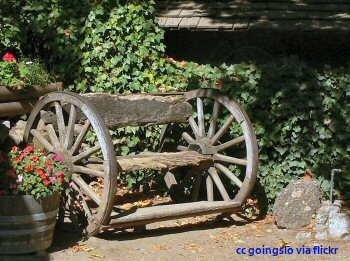 A rustic bench made, perhaps, from one of the stagecoaches that passed through here. We stopped here last year for the first time and were greatly impressed with the quality of the menu. We arrived on a weekday at about 4:30 in the afternoon and made our reservations and then looked around. There are a number of old buildings there, including the original Ojai (a Ventura County town) jailhouse. We also made our way down Stagecoach Road where it crosses under the new bridge. It's impressive to see and there are plaques marking out some of the historic significance. 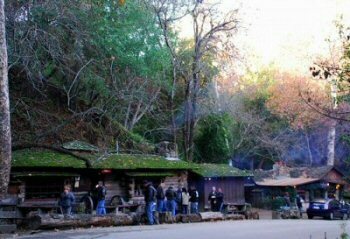 The Tavern is situated on Cold Spring Creek and while we were there in the late autumn, the creek is undoubtedly impressive in the rainy season. We then were seated for dinner and while I thought the atmosphere was nice, I wasn't expecting anything special with the food, perhaps chicken and beef. I was mistaken. The regular dinner menu includes breast of duck, venison, lamb, rabbit and pork as well as what I had been expecting. Selection is one thing, quality another and the quality was very good indeed. We were very well pleased with the main course, the appetizers and the side dishes. The only place where the kitchen stumbled a bit was in the dessert. It just wasn't up to the quality of the rest of the meal. 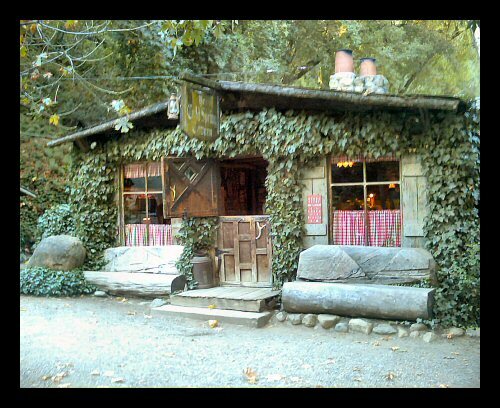 Final Verdict: The best roadside restaurant anywhere in Central California; the best backroad restaurant and certainly in the top 10% of all other restaurants. The Tavern is very popular on the weekends and there are large crowds there for the famous tri-tip sandwiches, the breakfast menu and the musical entertainment. 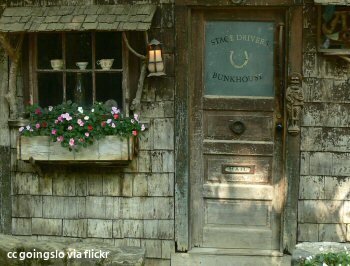 If you visit on a weekend, you may have to park a ways from the tavern, but it's not a horrible walk. Weekdays are generally much quieter and our during our dinner visit there were perhaps three or four other parties. Even if you are somewhat averse to crowds, the food might sway you to brave them.